"In his speech last week responding to high gas prices, President Barack Obama insisted that "we can't just drill our way out of" our energy woes. Actually, we can—and if the president wants proof, he should travel to boomtown USA: Williston, North Dakota. The Census finds that North Dakota led the nation in job and income growth in 2011. It has the nation's lowest unemployment rate, at 3.3% (California's is 11.1%), and it saw a huge 38.5% increase in its number of millionaires between 2009 and 2010, according to state tax return data. California, by contrast, lost nearly 50,000—or almost one-third—of its high-income residents ($500,000 and above) between 2007 and 2009, according to the Sacramento Bee. North Dakota is also flush with cash and a budget reserve of at least $1 billion, out of a $3.5 billion biennial budget. The state has already cut income taxes, and it is building thousands of miles of "shovel ready" infrastructure projects—roads, bridges, railroads, pipelines—without almost any of Uncle Sam's funny money. Bismarck may be the only state capital in the country that debates what to do with all its tax riches. Perhaps they could send it as foreign aid to Sacramento. California's budget analysts just announced their fifth straight year of fiscal plague, with up to $6 billion of red ink for 2012-13. Budgets for schools, transportation, health care, libraries and museums are being cut, even though the state already has one of the nation's highest income and sales taxes. Gov. Jerry Brown is sponsoring a ballot initiative this year to raise those taxes yet again. He'd be better off leading a fact-finding delegation to North Dakota to learn how to pay bills, create tens of thousands of jobs, and balance a budget. The short answer: Drill, baby, drill. Mr. Obama might want to come on that trip too." MP: The chart above shows the difference in job growth over the last five years between the two states. 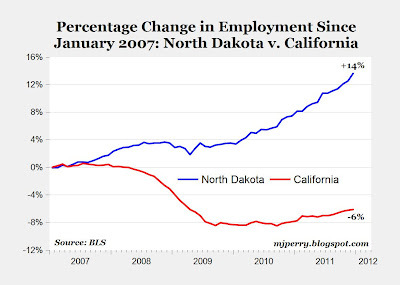 North Dakota has 14% more payroll jobs now than in 2007, and even the Great Recession didn't stop job creation in the Peace Garden State, as it expanded by payrolls by almost 2% between December 2007 and June 2009. In contrast, California payrolls shrank by almost 7.5% during the recession and are still 6% below the January 2007 level. Keep one thing in mind: Very few of the wells that are producing today will be operating in 10 years. Meanwhile, as Matt Simmons was wont to say, "Rust never sleeps." Actually, the mantra is drill on private land because the Feds are letting anybody drill on public land. To be completely fair, Texas vs. California is a fairer comparison than ND vs. CA. ND has a very small population, and 50,000 oil jobs can uplift the entire state. 50,000 jobs would not make a huge difference to CA. But the anti-business regime in CA is a valid target, and comparing Texas to CA, both large and diversified economies, would be a stronger way to make the point. Learn from North Dakota? That's pretty silly. North Dakota is benefitting from increased oil and gas development. California has 55 times the population of North Dakota. How much oil and gas would have to be discovered in California to make its economy improve as dramatically? I think most people understand that California is a larger state than North Dakota and that energy can not fix all of California's problems. However, that is not an argument for California not to embrace energy. California given its size can not expect any one industry to solve its problems. However, that does mean that California should not pursue energy. The way I look at it is: energy (if embraced by California) could be a part of the solution. A base to build on if you will-even if Krugman can not begin to grasp that principle. juandos: Thanks for the interesting chart. It appears that California DOES have a pretty good supply of oil. But, for oil to cause as much happiness in CA, as it has caused in ND, CA would need 55 billion bbl, which is 2.5 times the reserves of the entire US, and equal to the total reserves for North America. It's easy to see big changes in a state like ND, which has such a small population. When North Dakota has as many people as California, then North Dakota may aopt more California -like policies. 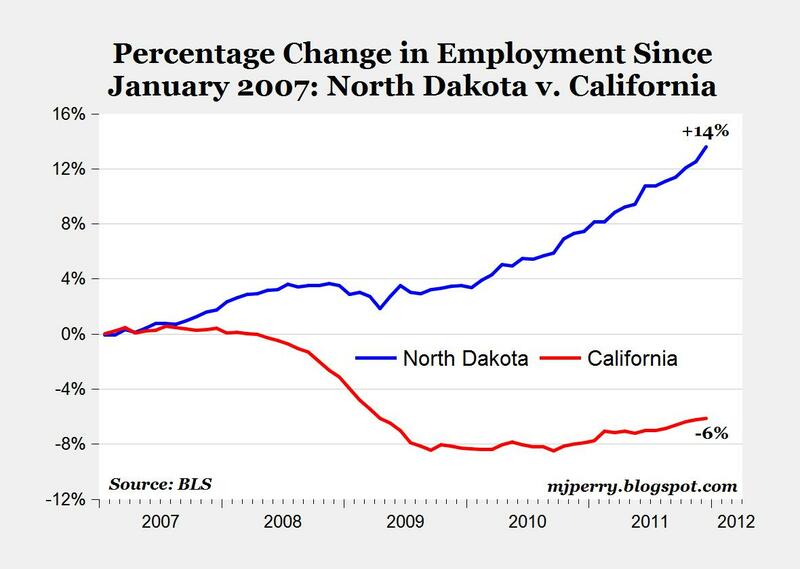 "When North Dakota has as many people as California, then North Dakota may aopt more California -like policies." ND will NEVER have as many people as CA due to the extreme weather. Has the Real Estate Market Finally Bottomed Out? Time To Call BS on ECRI's Recession Prediction? Khan Academy: Model for Future of US Education?